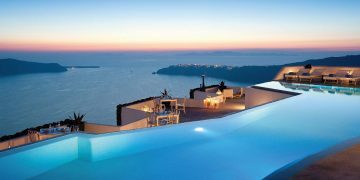 Experience Santorini's Astounding Beauty - The Travel Agent, Inc.
SANTORINI Sunsets, architecture, and a stunning caldera. 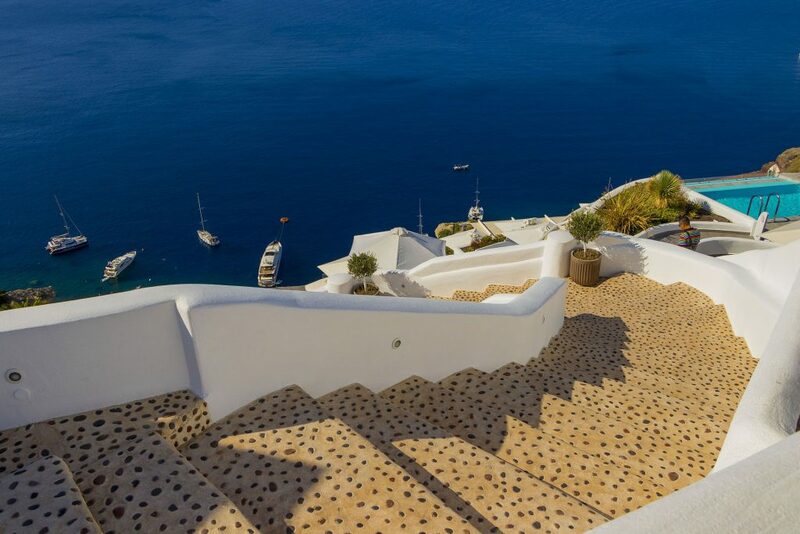 Known for its sunsets, architecture, and its stunning caldera, the island of Santorini features cities balancing on the edges of cliffs, fantastic vistas and beautiful beaches, as well as a culture that will pull you in and make you never want to leave. 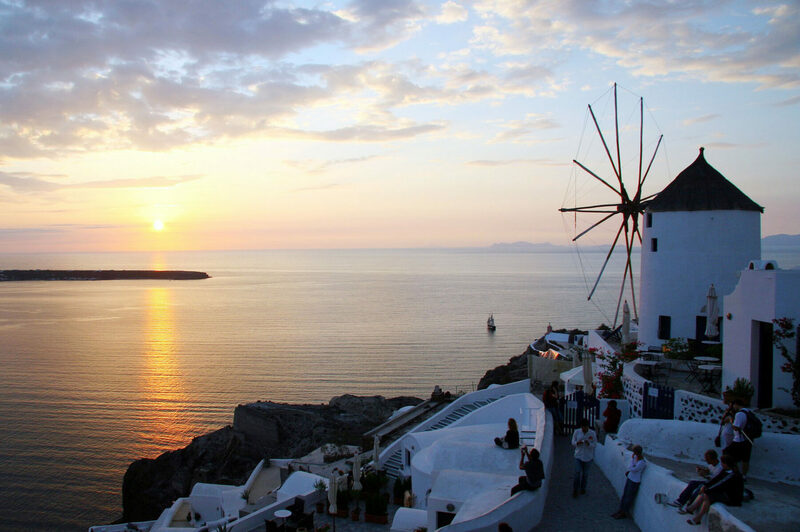 Fira is the main town on the island and the charming city of Oia is the place to find the best sunsets. 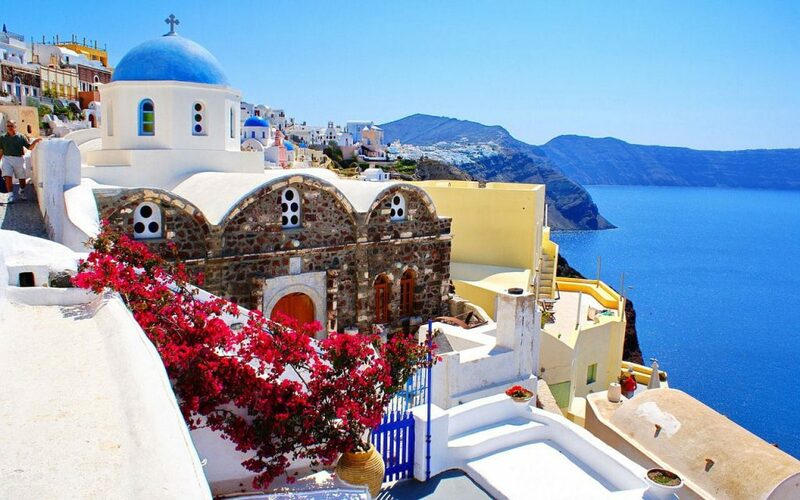 Both cities are known for their white washed buildings that cling to the edges of the cliffs of the caldera, formed from a volcanic eruption that created the beautiful bay. 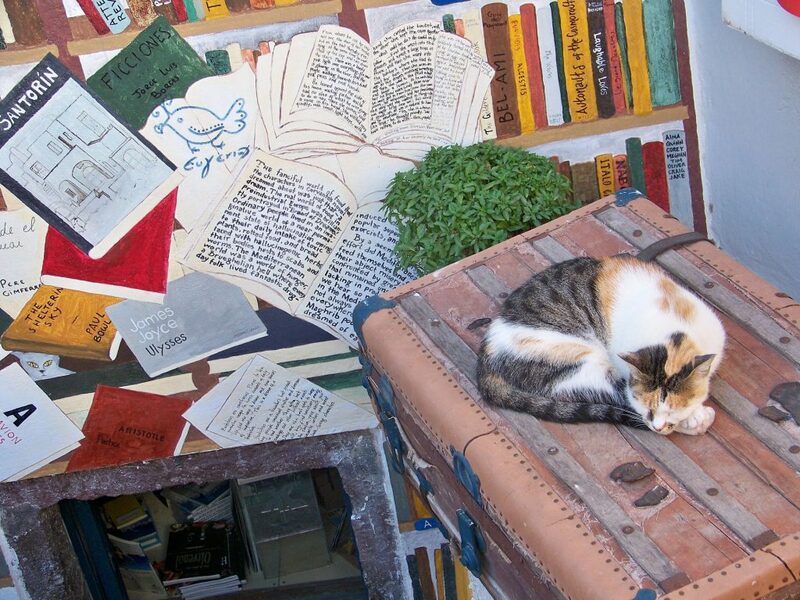 Santorini is romantic and relaxed, with plenty to do and see. There are many small islands in the middle of the caldera that still feature small amounts of volcanic activity. Take a boat out to one of these islands to feel the heat rising from vents and witness lava flows. Scuba diving and snorkeling is also available, one of the highlights being a wreck next to the volcano. There are many beaches to relax on, including Red Beach and Black Beach, each true to their names, as well as plenty of soft sand beaches. Explore the smaller villages to see the “cave houses,” homes that have been built directly into the stone. 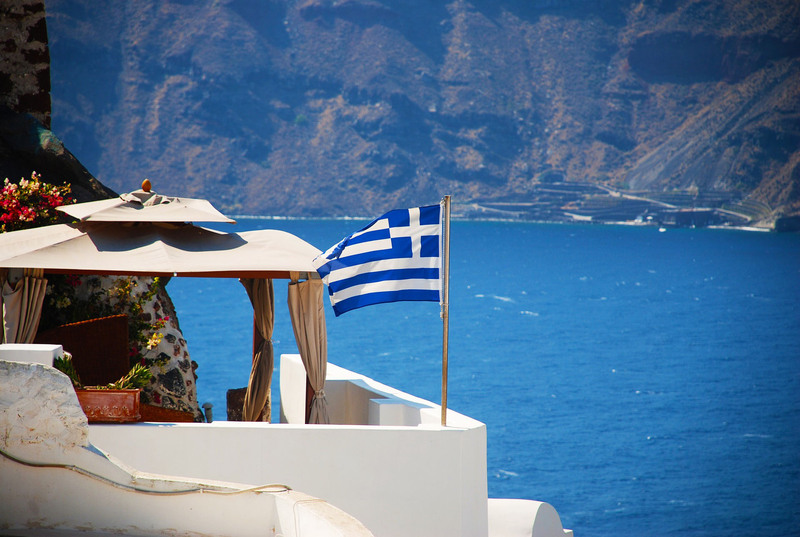 Take a horseback ride along a beach, or ride up the many steps from the port to Fira on the back of a mule. 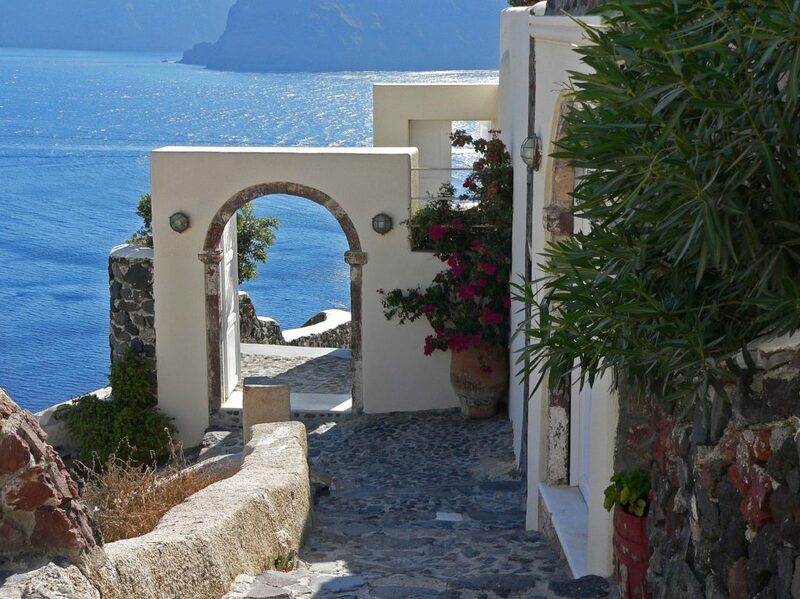 Simply stroll through the towns and take in the stunning and unique architecture this island has to offer. 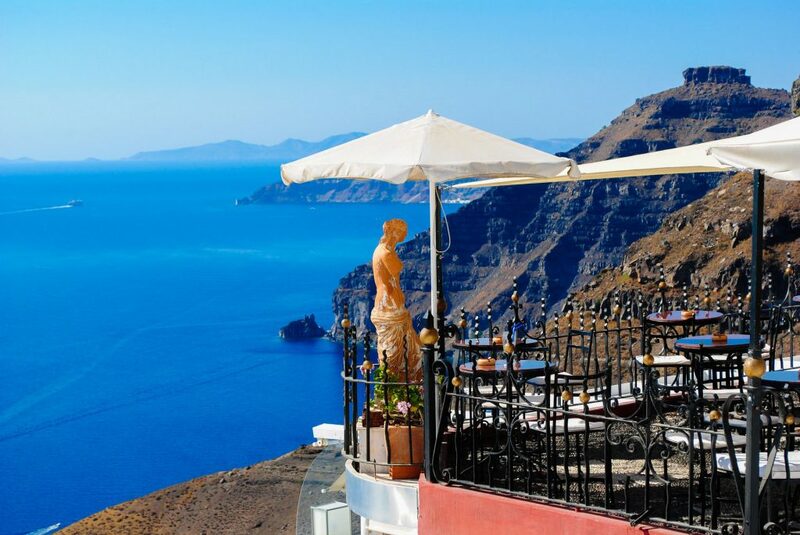 There are many wineries and authentic eateries around the island, many of which offer stunning views of the caldera. 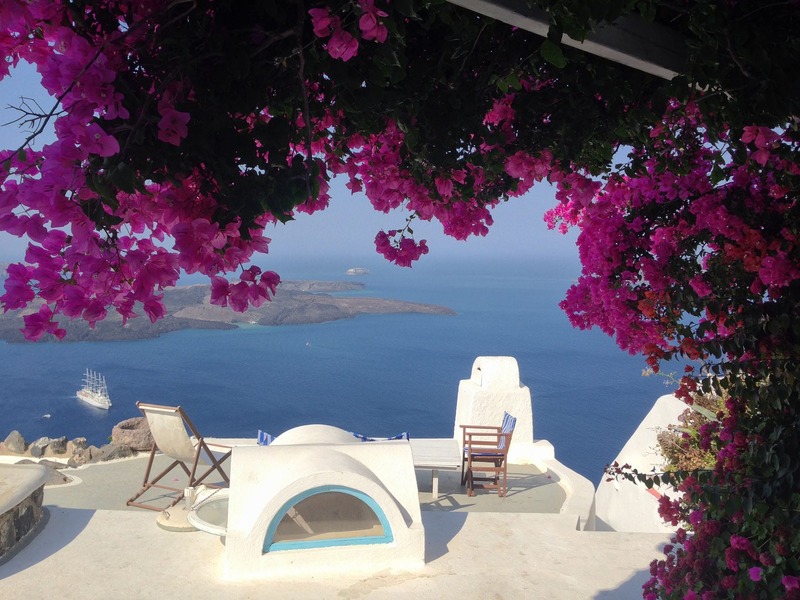 The simple Mediterranean cuisine in Santorini is exquisite. 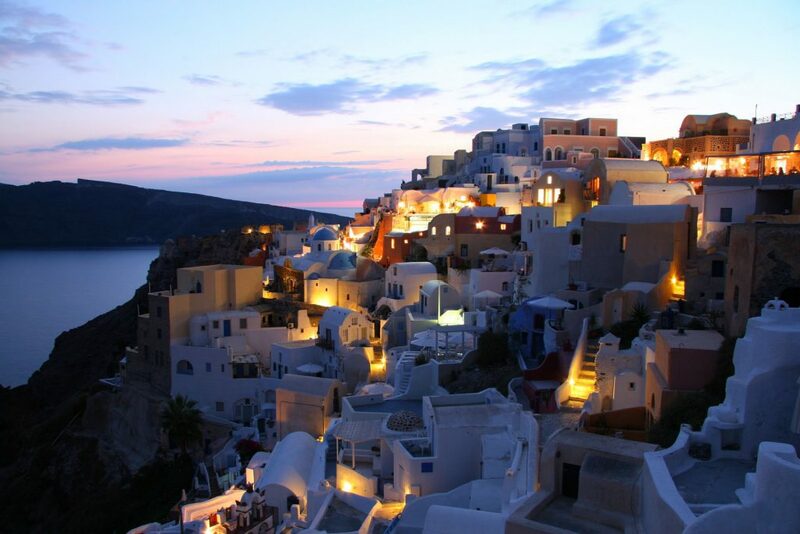 Santorini is also a popular place for destination weddings and honeymoons because of the romantic atmosphere. 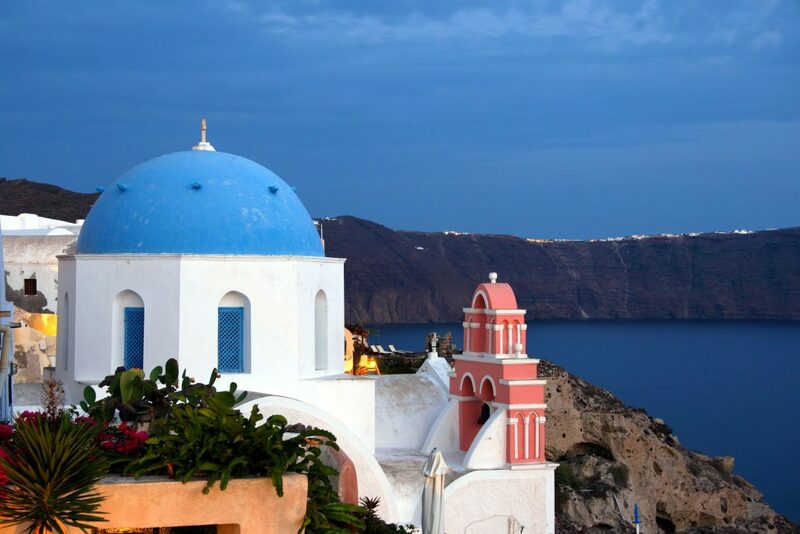 Get married in a small church or along stunning cliffs and stay in one of the resorts designed just for honeymooners. 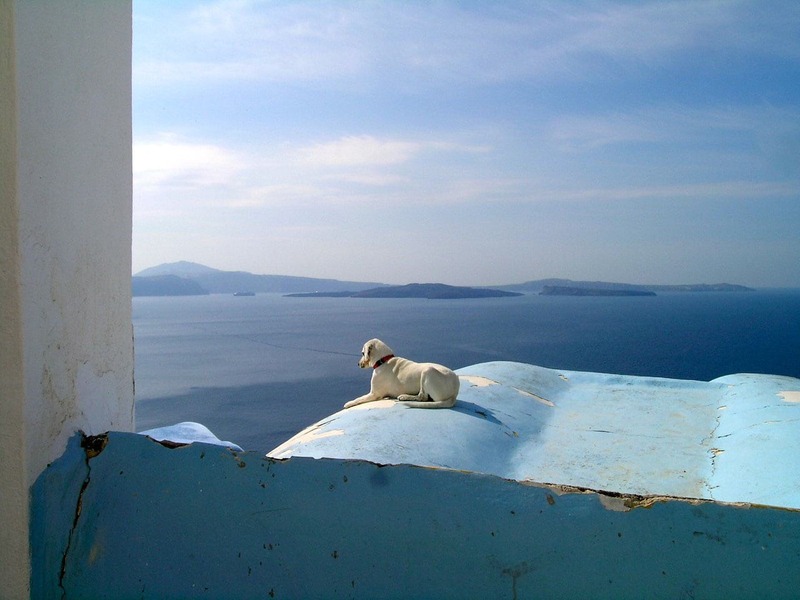 To experience Santorini’s unusual geography, it’s best to approach this Cycladic island from the sea. The barren rocky cliffs rise straight up out of the startlingly blue waters of the Aegean—their tops are dusted by what at first looks like a sprinkling of snow. Then, as you get closer, the snow takes the shape of Cycladic buildings hanging precariously off the hillsides. Zigzagging lines across the rock face become recognizable as roads that lead up from the sea to whitewashed houses perching on the cliffs. 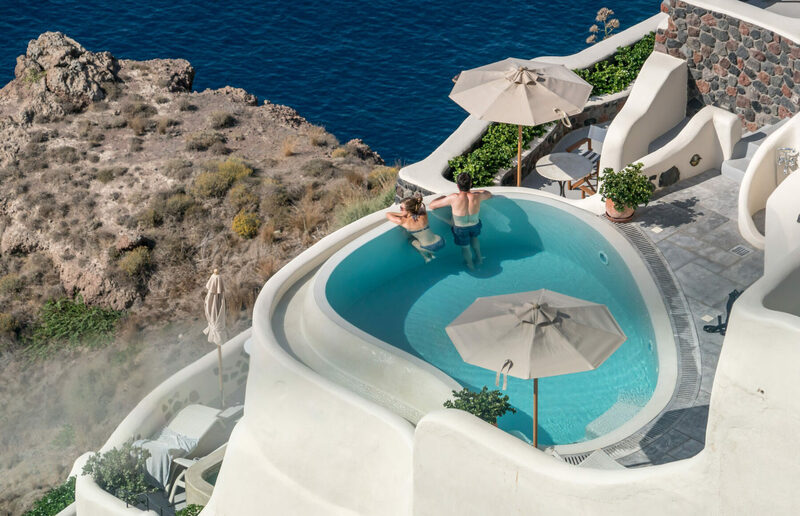 The twin settlements of Fira and Oia are known for their quaint cobbled alleys, white cubic buildings, chic boutique hotels with infinity pools, gourmet restaurants and unforgettable sunsets. 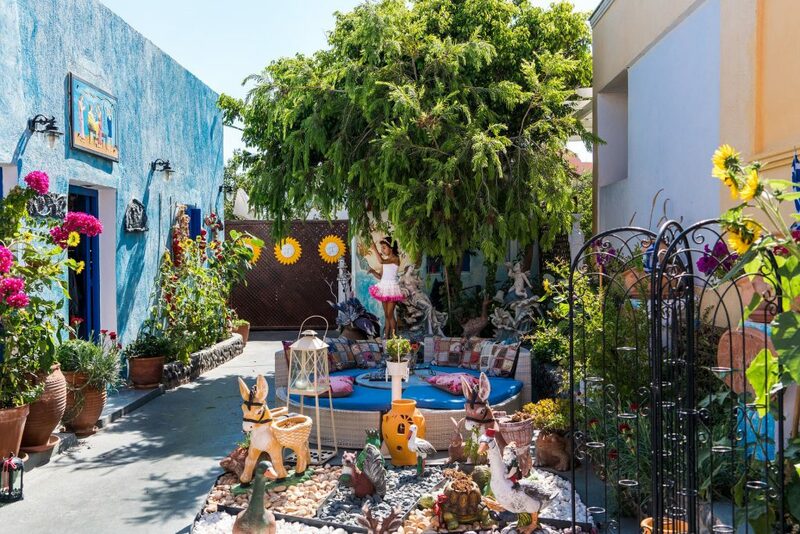 All these things add up to make Santorini an incredibly romantic holiday retreat for couples of all ages, as well as a wonderfully glamorous wedding and honeymoon destination. 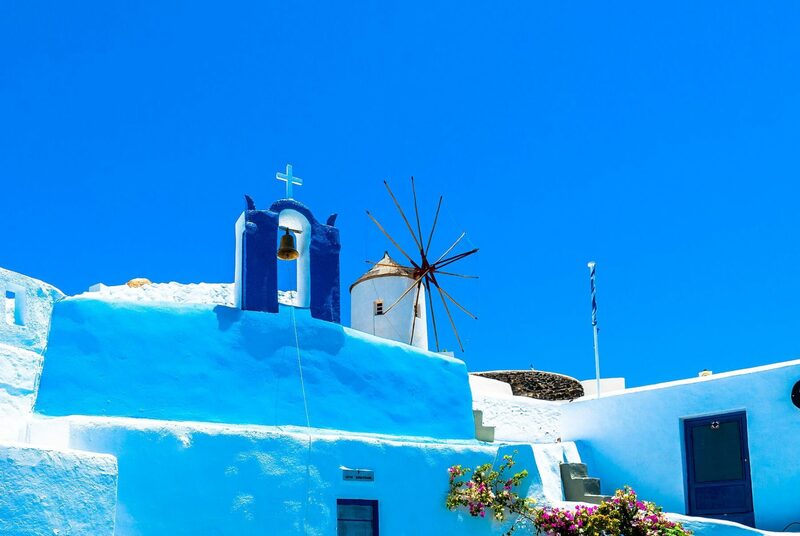 It’s not surprising that Santorini’s spectacular setting has made it one of the most-visited islands in Greece—in peak season it receives some 60,000 visitors each day and up to five cruise ships every morning. It’s also much loved by celebrities. 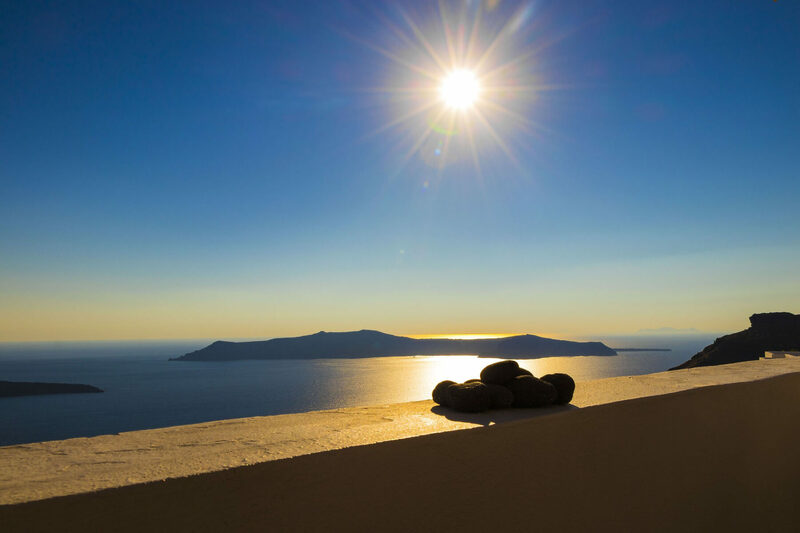 Santorini’s beaches are an anomaly, made up of black volcanic sand and lava pebbles. While the west coast displays dramatic cliffs plummeting down into the deep blue waters of the caldera, the south and east coasts are where you’ll find the beaches. Buses run regularly from Fira to Kamari (east coast) and Perissa (southeast coast), whose black-sand beaches are lined by sunbathers and umbrellas and overlooked by a string of cheap to midrange hotels, informal tavernas and souvenir shops. Kamari and Perissa also have facilities for watersports such as scuba diving, waterskiing and windsurfing. However, the must-do is a boat excursion or private chartered sailing trip across the caldera to the two small, uninhabited volcanic islands of Palea Kameni and Nea Kameni, which still spout volcanic gases. 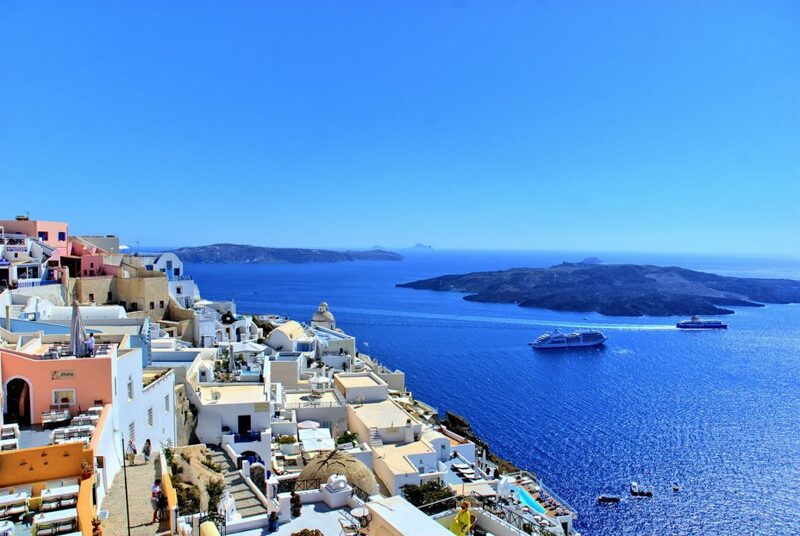 Santorini Sailing is the best option, they’ll pick you up at your hotel and it will be a day you will never forget! If you’re looking for a pleasant beach, you’ll have to settle for black volcanic sand (small rocks really) on the eastern side of the island. Buses run regularly from Fira to Kamari and Perissa, whose black-sand beaches front a string of tourist hotels, restaurants and shops. 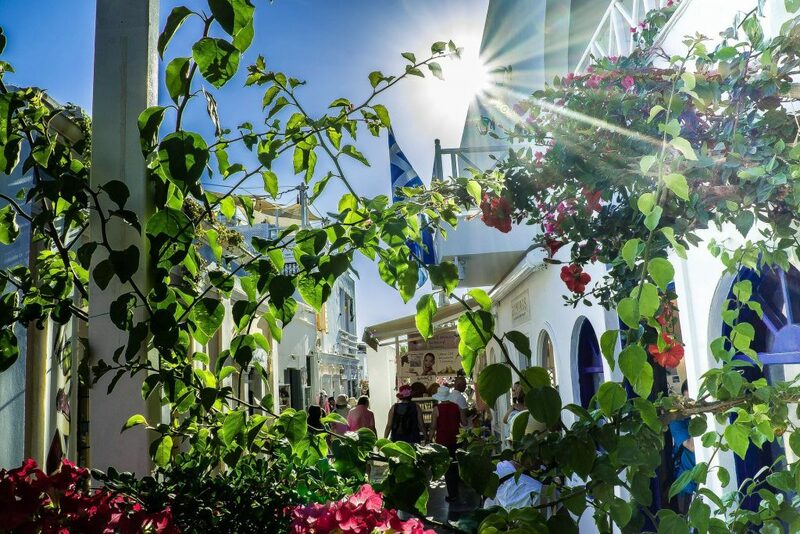 Fira and Oia are pedestrian-only—it is a pleasure to explore their steep, winding alleys, but be sure to wear comfortable walking shoes. Though public transportation on the island is good and inexpensive, buses can be very crowded in summer months. Rental cars are available if you want to explore on your own. Be aware, however, that hairpin turns and narrow roads are commonplace. For that reason, we don’t recommend renting a motorcycle or scooter (though you will see plenty) unless you are an experienced driver. Don’t expect dance clubs to warm up until well after midnight. 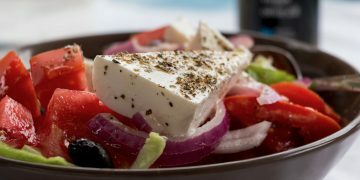 Greeks eat late and rarely go out before 11 pm. Vedema, A Luxury Collection Resort An exclusive world unto itself.